This past week was full of excitement! I got to interview Stephen Shedletzky, celebrate Thanksgiving and start decorating for Christmas!!! Woo hoo!!! This really is my FAVORITE time of year…. AND…. not to mention that I am so thankful for you, LIPTalk Nation, more than you know. We are only three months in and we have already reached a HUGE milestone… over 4,000 plays for our podcast and the numbers are going higher every day. This time last year, I had know idea that I would be the host of a new kind of podcast that would start a “Confidence Movement” among people to deal with their past and move forward. If you have listened to our “Why Purple” episode you know our vision and our “WHY”. But on this blog, I want to talk about YOUR “WHY”. Have you defined it? Or do you just “Feel” it? 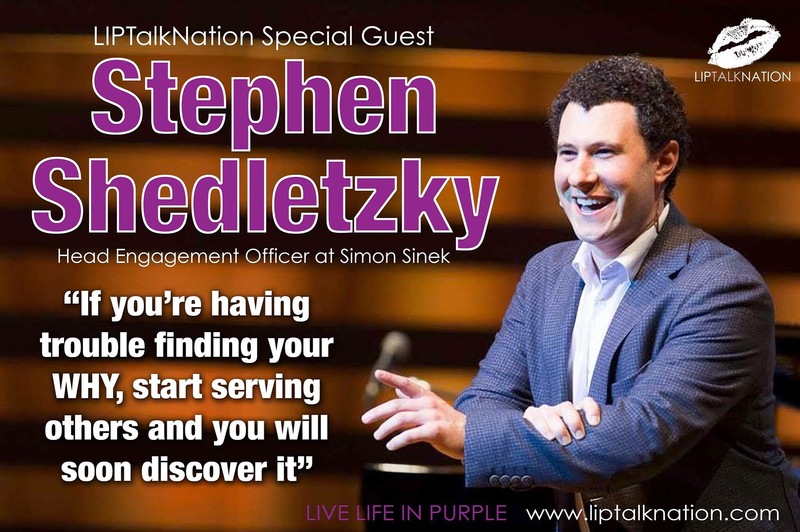 Stephen Shedletzky is the Head Engagement Officer at Simon Sinek. In case you don’t know who Simon Sinek is, he founded the “Start With Why” movement. Stephen get’s to wake up every day helping people discover their “why”. How great is that?? I first discovered Simon and his movement earlier this year, when one of my friends posted his TED talk. The words that Simon said, “People don’t buy what you do, but why you do it”, resonated with me so much that I had to listen to this talk over and over again. Seriously, I almost had it memorized. It was then, that I defined my why. In simple terms: I want to help people: Mentally, Physically, Emotionally and Spiritually; but, to explain it deeper: I want to help people conquer the negative voice inside their heads. AND, to expound on this…. I want to teach people, who have experienced tragedies in their lives, that they are worthy to succeed. That they ARE good enough and that WE ALL are WONDERFULLY MADE. At the very beginning of my interview with Stephen, he said something that I want ALL of you to grab on to, “We are ALL created, by God, to serve others”. As I reflect just on this statement, the world would clearly be different if we ALL thought this way. Serve others?? What a concept… I would add on to this that we should treat people the way we WANT to be treated, not the way we’ve been treated. Sometimes I wonder why more people don’t think this way…. sigh…. As Head Engagement Officer with Simon at Start With Why, Stephen spends most of his days speaking and facilitating individuals, teams and organizations to find, clearly articulate and live their “WHY”. If you attend one of his or Simon’s workshops you will learn how great leaders lead and how to access the Limbic system of the brain. IF you want to know what that is, I challenge you to listen to Stephen’s episode. He mentions the What, How and Why and how to reflect on each one. The most interesting part of this interview was that he said we are able to discover and define our why by the age of 20. We have experienced enough of life’s pattern to articulate our “Why”. “Serve others and you will soon discover your why”. Stephen shared with me some of his most vulnerable moments in life. He talks about how he overcame a huge stuttering problem, depression and even pain. But in order to do this, HE decided to conquer it. Which is, I believe, the first step to wanting to conquer the negative voice inside your head. Like some of you reading this, Stephen wanted more out of life, even though he had the corporate job and living a comfortable life. He is so grateful for one of his mentor’s who introduced him to the “Start With Why” movement. Talk about being at the right place at the right time… Stephen had the desire to define his “why”. Which is exactly the first step he mentions to defining YOUR “why”. But even then, if you have the desire to define it, but still struggle how to define it, Stephen challenges you to start serving others and you will soon discover your “Why”. I have experienced this for myself. Life isn’t about money, but about people. It’s about Helping others. When we help others, we WILL discover our “why”. So ask yourself, Who are you on the inside? Then you need to commit to your commitment. Stephen’s final advice was “Don’t go it alone.” Remember, he said serve others. Life really is about helping people. We are ALL created, by God, to serve others. You must first have the DESIRE to define your why. Server others and you will soon discover your why. www. startwithwhy.com There you will discover more resources to help you and your business discover how you can define your “WHY”. Stephen really does live a LIFE IN PURPLE.